Home is where the habitat is: This Earth Day, consider installing insectary plants. 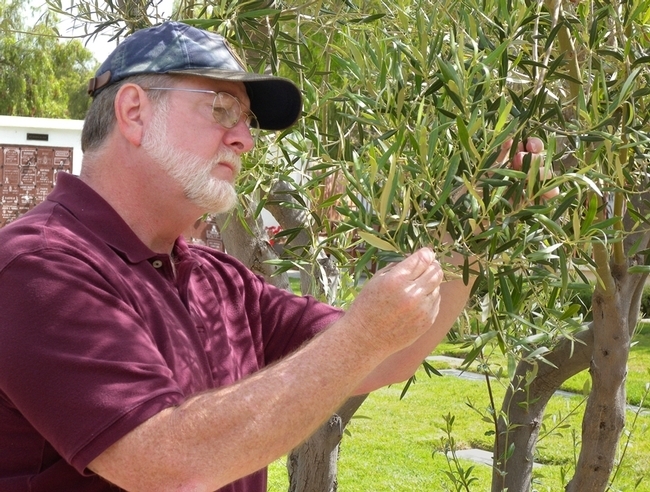 New videos from UC IPM help stone fruit growers and PCAs tackle pest problems. Spider mites, fruit moth and twig borer larvae, aphids, and bark cankers are just a few pests that can wreak havoc on stone fruit trees. With spring well underway and trees in full bloom and beginning to develop fruit, it's time to monitor and take action before these pests get out of hand. 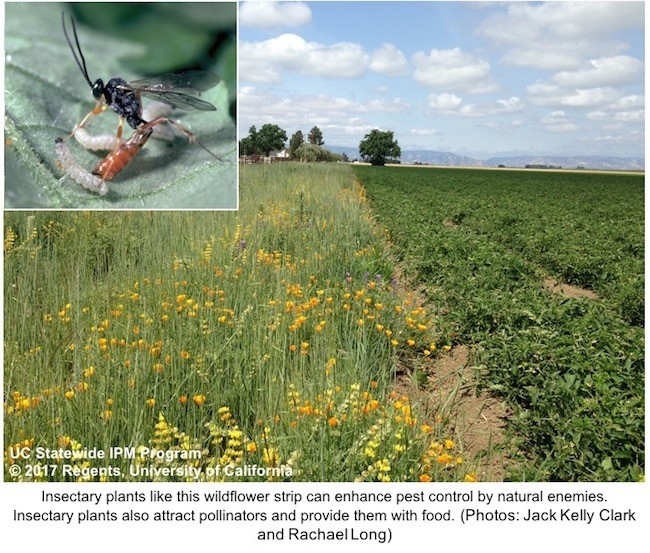 UC IPM teamed up with UC farm advisors to develop a series of how-to videos that can help growers and pest control advisers monitor for pests and damage and determine if and when treatment is needed. In one video, Sacramento Area IPM Advisor Emily Symmes gives a brief overview of how to monitor for webspinning spider mites. Spider mites build up in stone fruit trees as the weather warms up. Late spring through summer is the ideal time to monitor for mites and their damage, which includes leaf stippling and webbing. If mites build up too much, leaves can drop, fruit may not fully develop, and branches and fruit can be exposed to sunburn. 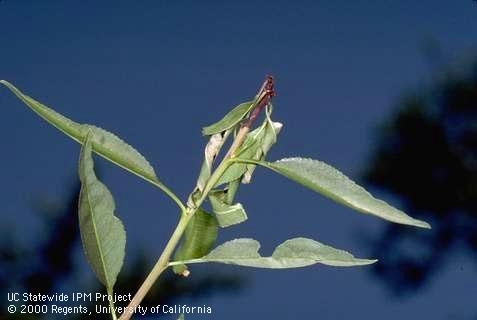 Shoot strikes, or dead drooping leaf tips, are often seen on young peach and nectarine trees. In a second video, UC Sutter and Yuba County Farm Advisor Janine Hasey explains how to monitor for shoot strikes and how to distinguish the culprits, oriental fruit moth and peach twig borer. 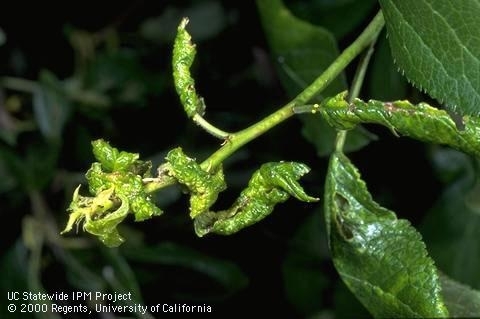 Although Oriental fruit moth and peach twig borer can bore into both foliage and fruit, they cause the most devastating damage by feeding on fruit. Early season monitoring and treatment can prevent future fruit loss. 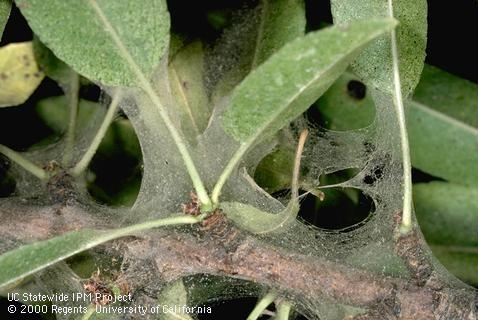 In plum and prune orchards, leaf curl aphids and mealy plum aphids cause leaves to curl and become distorted. Aphids produce honeydew, which can lead to the development of sooty mold, causing fruit to crack and blacken. Aphids are often present when leaves start to grow. In his video, Rick Buchner, UC farm advisor for Tehama County, discusses how to monitor for aphids and explains how to decide when treatment is warranted. In a final video, UC Sacramento County Farm Advisor Chuck Ingels teaches how to distinguish Phytophthora root and crown rot from bacterial canker. The two diseases are often confused because they both cause bark cankers. Phytophthora root and crown rot is confined to the lower trunk, but when a bacterial canker infection occurs in the tree trunk, the diseases can often be confused. 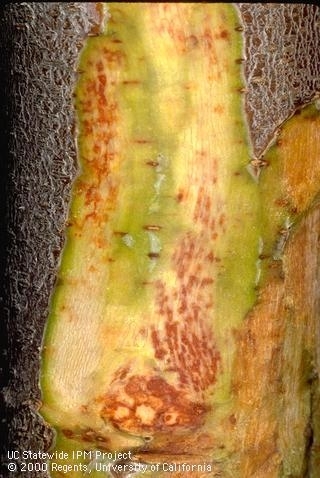 Bacterial canker can be confirmed by cutting away the outer bark and looking for characteristic red flecks on the inner bark. Correct identification of these diseases will help in choosing a management strategy. You can find all of these how-to videos on the UC IPM video library page. For specific information about managing pests in stone fruits or other crops, see the Pest Management Guidelines. Webbing caused by webspinning spider mites. Shoot strike caused by oriental fruit moth. Leaf distortion caused by leaf curl plum aphid. Reddish flecking symptoms of bacterial canker. Come visit UC Division of Agriculture and Natural Resources at the 2015 World Ag Expo. On your tour of World Ag Expo 2015, make sure to come by the University of California Division of Agriculture and Natural Resources (UC ANR) exhibits at Pavilion A and B (northwest corner of the Expo), clustered at booths 1411, 1412, 1512 and 1513. Serving local Californians since 1913, UC Cooperative Extension (UCCE) maintains offices throughout the state through a partnership between local county governments, UC ANR, and the US Department of Agriculture. UC Cooperative Extension advisors help identify and solve local problems through research and educational programs that focus on the evolving needs of growers, youth, families, agencies, policy makers and the general public. Staff will provide specialized programming for an Agriculture Day (Tuesday, Feb. 10), a 4-H/Nutrition Day (Wednesday, Feb. 11), and a UC Master Gardener Day (Thursday, Feb. 12). The Research and Extension Center System (RECS), which extends from the Oregon border in the north, through the Sierra Foothills and Central Valley, and along the Pacific Coast and south to the border of Mexico, includes sites in a wide variety of California ecosystems, allowing researchers and extension educators to effectively address regional challenges and issues. It is the only UC statewide program that can provide researchers with a premier research management organization including land, labor, facilities and equipment, in a wide variety of real-world, outdoor growing environments, where they can pursue new knowledge for the benefit of agricultural and resource science, industry, and the general public. Centers are also focal points for community participation and active involvement in finding ways to address current and relevant regional agricultural and natural resource challenges. 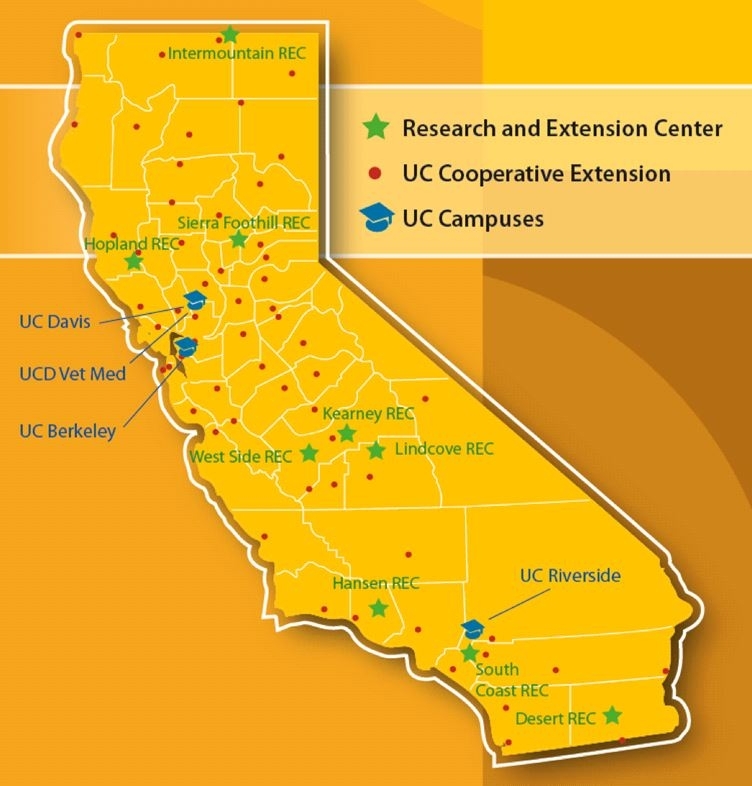 The RECS centers support projects involving county-based cooperative extension advisors and campus-based research specialists, as well as researchers from Land-Grant institutions in other states, the California State University (CSU) system and USDA as they conduct their research and education programs. Officially dedicated in 1965, KARE has achieved international acclaim for leadership in the development of new fruit, nut and grape varieties, innovative cultural and irrigation practices, pest and disease management techniques, and new understandings of postharvest biology. KARE plays a leadership role in maintaining the quality of California's rural environment, with programs in air, soil and water quality and mosquito management. Established in 1959 by San Joaquin Valley citrus growers, Lindcove REC covers more than 100 acres growing more than 400 citrus varieties. At LREC, scientists conduct research to evaluate new varieties of citrus and improved citrus-growing techniques and new ways to manage pests. Extension educational programs carry the practical results of this research to citrus industry clientele and the general public. Come learn more about the University of California's Division of Agriculture and Natural Resources, our history, and our research and programs across the state. You can also download our Cultivating California brochure. UC ANR is a statewide network of University of California researchers and educators dedicated to providing individuals, communities, and industries with science-based information and solutions to address the important issues California is currently facing. UC ANR is an engine for problem solving, working with industry to develop and improve agricultural markets, help keep a good balance in international trade, address environmental concerns, protect plant health, and provide farmers with scientifically tested production techniques and the tools necessary to maintain a safe food supply for consumers. CASI has over 2,100 university, farmer, National Resources Conservation Service, and private-sector partners working to develop and evaluate a wide range of cropping system alternatives for California's diverse cropping sectors. The practical coupling of agricultural production and strategies for water conservation via efficient tillage and irrigation are important aspects of CASI's current work. Map of the UC ANR network. A training and certification workshop was held at UC Kearney Agricultural Research and Extension Center for agricultural pest management professionals and successfully added 23 individuals to the registry of Technical Service Providers . The goal of the workshop was to train, certify and register individuals with integrated pest management (IPM) expertise to support the mission of the United States Department of Agriculture Natural Resource Conservation Service (NRCS) as Technical Service Providers. These new Technical Service Providers will support the mission of NRCS by augmenting highly technical areas in the development and documentation of IPM Conservation Activity Plans. Using private sector expertise in conjunction with NRCS personnel and UC IPM Pest Management Guidelines, additional services can be provided to landowners seeking mitigation to natural resource concerns. The workshop was conducted with University of California Agriculture and Natural Resources, UC Cooperative Extension, the UC Statewide IPM Program, NRCS and the Association of Applied IPM Ecologists. NRCS provides expertise to landowners to address and mitigate on-farm resource concerns that affect air, water, wildlife, soil and humans. In recent years, there have been increased requests for assistance to mitigate resource concerns linked to pests or pest management activities. One of the trainees was Sylvie Robillard from Tecolote IPM Consulting, who has been a pest control adviser specializing in IPM consulting for 25 years in Fresno, Kern and Tulare counties. She feels that the use of Technical Service Provider consultants will increase the number of farmers using conservation activity plans for IPM. Farmers currently using Robillard’s services already practice IPM and have a desire to conserve natural resources so that they can continue to farm. Robillard believes that by using the USDA NRCS tools and being registered as a Technical Service Provider, she can better help her clients document and refine their conservation plans. With more Technical Service Providers, more farmers can become aware of and use Technical Service Providers to help create conservation activity plans for IPM and implement conservation efforts in accordance with NRCS guidelines. 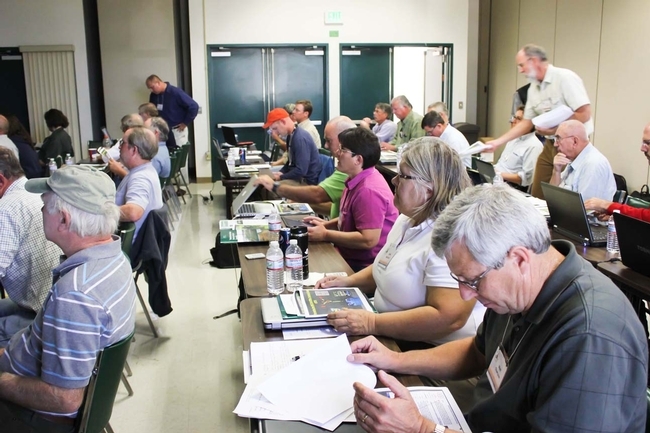 Agricultural pest management professionals training to become registered Technical Service Providers capable of developing conservation activity plans that meet integrated pest management and United States Department of Agriculture Natural Resources Conservation Service guidelines.